Mrs. Reed and Gordon discuss details for State Honor Day Program amidst backdrop of flags at Expo. Washington State has left its mark on the rest of the country through Expo '74, as has Spokane. An outstretched hand of welcome, amply filled with hospitality and friendship, that has been extended so effectively to visiting officials from 31 states and territories during the first five months in State Honor Day Pro­grams at Expo '74 has received a full measure of accolades from the many recipients, an achievement to which many aspire, but few ever attain. But that accomplishment has not been a happenstance — nor was it done single-handedly. It has been a cooperative effort involving five part­ners, all making their individual con­tribution to get the whole show on the road to success. And overseeing the entire giant production have been two members of Gov. 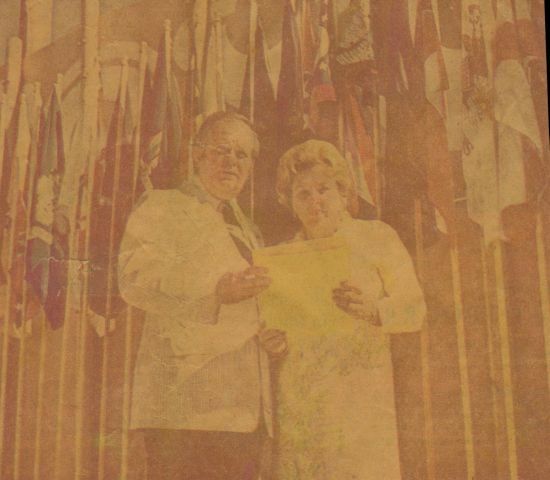 Daniel J. Evans' staff — John F. Gordon, Seattle, special assistant for Expo '74 and also a member of the Washington State Commission for Expo, and Mrs. Donald B. (Gerry) Reed, his Eastern Washington aide and "Girl Friday." The efficient staff also includes Charles Hord, Kristi Lee, Mary Rice, Thomas G. Hogan and Rol Herriges. Theirs has been a hectic but happy summer filled with fun and humorous happenings as well as very frantic moments, split-second deadlines and most of all "wonderful people", they all agreed. Gordon, who has been in Spokane far more than Seattle this summer, said, that the plan to honor states and their officials was discussed first in November, 1972. Involved in the hos­pitality undertaking since its incep­tion have been the offices of Expo '74 management and of the U.S. commis­sioner general, the mayor of Spokane, the World's Fair Commission and the offices of the Governor, both here and in Olympia. And working behind the scenes has been a hospitality committee put together by Luke Wil­liams Jr., and composed of business­men, whose main purpose is to help defray the costs of gifts and other expenses incurred over and above those underwritten by bonds. "In the beginning, the project was started as a means of involving as many states as possible in the fair and to promote negotiations with them for bringing exhibits," Gordon said. "The • development of the State Day Pro­grams was the second step and one that everyone agreed was a proper function for the state to become in­volved in. "After all," he added, "At that time Gov. Evans was chairman of the Na­tional Governors Conference and was to be the host for their meeting in Seattle while the fair was in progress in Spokane." A typical day for honoring a state, its governor, his family and any other officials who accompany him usually begins early with a welcoming recep­tion at the airport," Gordon explained. "A few state heads have flown in early to spend more time at the fair, and in such cases, appropriate wel­comes and entertainment always is planned — no official ever has been left to his own devices, regardless of how busy we have been," Mrs. Reed pointed out proudly. Because of the tight schedules maintainmed for each group of visiting officials, a daily manifest of activities is prepared by Gordon and Mrs. Reed with the help of the office force. Al­though the schedule becomes very hectic at times, they all have man­aged, somehow, to maintain their cool and flexible enough to make changes in the procedures r;ght down to the zero hour. Seating adjustments for state day programs rrtust be adjusted frequently when someone can­not attend or when more come than are expected," they said. Following the airport recep­tion, the top state official usually is whisked to the Ridpath Hotel for a news confer­ence — Mrs. Reed must be off and running early to arrange for coffee and other facilities for the media at these events as well as to introduce ever­yone, keep the state patrol of­ficers abreast of time and transportation schedules and generally see that everyone, including the governor's wife and family are well cared for. For each state day different Spokane citizens have been in­cluded in the ceremonies, the luncheon given by the Spokane Chamber of Commerce and the State dinner that night. These people are invited by Gov. Evans to participate and to meet at 11 a.m. in the re­ception room at the Washing­ton State Pavilion for coffee and to meet the dignitaries be­fore the official ceremonies. All of these arrangements also are handled by Mrs. Reed and Gordon. Mrs. Reed said she provides a guest book, which later is given to the state officials as a remembrance of the day. She and Gordon introduce all of the participants and with the help of Thomas G. Hogan explain the procedures and help line everyone up in pro­per seating order. Seat num­bers are provided for those who will sit on stage, much like an airplane reserves its seating space. Gordon explained that the State Honor Day programs at Expo are America's first ma­jor events in the two-year span of celebrations leading up to the 200th birthday of the United States. "The programs saluting the history of each state of the union and its role in the entire scheme of things, are filled with Americana — patriotic music, oratory, flags and na­tional symbols —-all in seem­ing contrast-to the theme of the exposition "Man and His Evironment," Gordon said. "But the bridge between theme and American history is made each time in the address by Gov. Evans, who serves as host for the honor days. He comes from Olympia for each and cites the evolu­tion of America, its progress and renewed interest in ecol­ogical matters as that bridge between past and present." Gov. 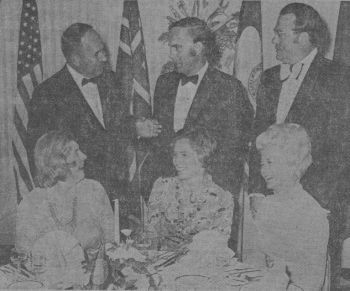 and Mrs. Stanley Hathaway, Wyoming, left, visit with Gov. and Mrs. Evans, center, and Mr. and Mrs. Luke Williams Jr.
Governors on their state days may bring their own offi­cial delegations, bands, drum and bugle corps—they pay their own way here but are guests for the festivities given here in their honors. Hawaii sent a sextet of singers, dancers and musicians; Utah Day was highlighted by the appearance of the famed Mormon Tabernacle Choir and far-off American Samoa brought a 100-person cultural singing and dancing troupe. Yank hospitality had its best test when southern governors came but from Virginia's Gov. Mills E. Goodwin Jr., South Carolina's Gov. John C. West to Georgia's Gov. Jimmy Carter and Arkansas's Gov. Dale Bumpers, the verdict has been that the Washington State welcome is "sans rival." "Eight Soviet governors joined the celebration on one occasion," Mrs. Reed said. "And the large delegation from the U.S.S.R. broke bread at the black-tie dinner that night and toasted their counterparts from as far away places as Missouri, New Hampshire, New Jersey and Arkansas." Every U.S. Governor has been invited to have his state day at the fair," Gordon said. "So far 31 have done so— Pennsylvania, Louisiana, Kan­sas and Kentucky are scheduled for the honor next week and others still are negotiating." Oregon Gov. Tom McCall arrived in the middle of a mid-May snowstorm, but most of the days have been warm and sunny. Montana Gov. Tom Judge enjoyed his day at the fair so much, he's been back and several other governors have ex­pressed the hope they can do the same, Mrs. Reed said. At the luncheon that follows each ceremony, the governors and their party are entertained by the Spokane Chamber of Commerce and immedi­ately afterwards, Expo '74 takes over with Jack Geraghty, vice president in charge of guest relations, and Judy Romeo, assistant to Expo manager Petr Spurney arranging the schedules to visit the fair. Topping off the entire celebration for the governors is the state dinner, a black-tie event with Gov. and Mrs. Daniel J. Evans as hosts, which is held at the Ridpath Hotel. Gordon said he and head cateress, Connie Larson, ar­ranged three menus in a meeting with the hotel's chief chef. "After testing and making the necessary changes, we settled generally on the meals we liked best and those are served on a rotating basis, so those who must attend more than one dinner will not be exposed to the same meal too often," Gordon said. Typical is the gourmet din­ner served for Gov. and Mrs. Stanley K. Hathaway of Wyo­ming which included: Chilled Consomme Madrilin, stuffed filet of sole with crab meat and Mornay sauce, cham­pagne sherbet with apple brandy, beef Wellington, avo­cado and tomato slices with bibb lettuce and French dress­ing, French pastries and ap­propriate wines for each course. "The formality of head ta­bles has been disposed of," Mrs. Reed said. "In this way guests may visit and become better acquainted during the time they are together." Those who serve the dinner have been trained in the spe­cial procedures for the formal event using serving dishes. They wear white gloves for the occasion. Speeches are forgotten for the evening too, except for toasts that are exchanged between the governors and for the presentation Gov. Evans makes of gifts to the visiting governor and his wife, a final seal of a lasting friendship be­tween two state heads during a visit to Spokane's world fair.